In the middle of a city filled with Old World stuccoed walls and tiled roofs, a boy’s shadow yearns to break free. “If life is a book, then Smoot the Shadow had been reading the same yawn-colored page for seven and a half years.” The light-skinned boy connected to the protagonist—clad in shorts, jacket, and baseball cap—leads a rigid, mostly black-and-white life; he colors inside the lines. Smoot (a blend of “smudge” and “soot”?) finally breaks free. As the shadow wordlessly, gleefully skips rope, rides a carousel, and climbs a tree, the boy is ever watchful from the margins. Inspired, other shadows follow their dreams: a frog’s shadow turns into a prince, and a dragonfly’s breathes fire. 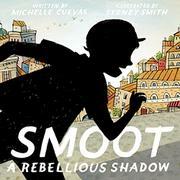 Imagining unintended consequences were this to continue, Smoot quickly finds satisfying, child-sized solutions for his restless counterparts and reunites with his boy, whose own spark has been ignited. Cuevas’ plotline radiates freshness and celebrates the rewards of risk-taking. Smith has a keen understanding of the power of the contrast between blackness and color. Employing ink and watercolor, he skillfully exploits this dynamic to both foreground the silhouetted characters and, in concert with decisions about when to use frames or full bleeds and controlled lines or looser strokes, to underscore the distinctions between a constricted and unfettered existence.